Some veterinarians dispense prescription drugs without advising owners of potential reactions thereby doubling the danger because pets can't talk and owners don't recognize symptoms! 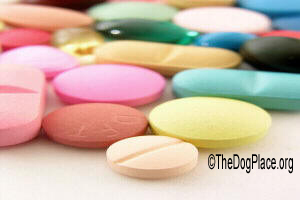 Here's vital medication information to protect your dog - and your veterinarian. JAMA (Journal of the American Medical Assoc.) reports “Adverse Drug Reactions result in over 215 million emergency room trips p/year. Prescriptions are the fifth leading cause of human death.” Adverse Drug Reactions (ADR) account for nearly 10% of all human hospital admissions. In human medicine, when an allergic reaction occurs, help is as close as the emergency room and the patient can verbalize critical information to the doctor. When your pet has an adverse drug reaction, he may be home alone or outside, thus symptoms can go unnoticed until it's too late. Even when your dog is by your side, he can't describe symptoms and you may not realize he is having an allergic reaction to the medication. Worse yet, you will unknowingly repeat the dose, leading to an emergency or death which is frequently UNDIAGNOSED and therefore, UNREPORTED as connected with that pet medication. 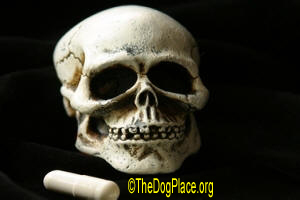 Veterinary medication reactions are much more frequent and even more deadly. If pet owners recognized the symptoms and onset of adverse reactions, veterinary hospital admissions would explode but deaths would steeply decline. Knowledgeable animal owners must accept that fear of malpractice suits in a suit-happy society makes vets very cautious about diagnosing and reporting adverse events. Thankfully most veterinarians react spontaneously to save a pet but the bitter truth is that dead dogs don't talk and necropsy is rarely mentioned when a pet dies from a medication reaction. Adverse drug (or food) reactions and side effects are usually limited to nausea, loss of appetite, diarrhea, rashes, swelling, and/or lethargy. Anaphylactic shock can occur within minutes but may be delayed for several hours after administering the medication. Anaphylactic shock is life threatening, resulting in respiratory and cardiac failure, and if not reversed, death. Vaccine reactions can cause seizures, partial paralysis, or general malaise or anaphylactic shock. Always note (on the calendar is good!) when your dog receives a new medication or vaccine and be alert for any side effects for at least 36 hours. When your pet receives any new medication, orally or by injection, ask your veterinarian for the prescription insert or CIS (client information sheet). This is not being negative, it is being wisely prepared and based on adverse reaction statistics, your veterinarian should be happy to provide it. If your dog has a reaction, no matter how mild, be sure it is properly reported. To insure accuracy and also that the form is properly filed, you and your vet should complete FDA form 1932 together and you should send it. Vets usually rely on staff to make such reports and slipups can occur. If you have a problem with using the form to report an allergic reaction, call the FDA directly at 1-888-FDA-VETS (888-332-8387) and leave a message, including the brand name, your phone number, and a request for help with FDA form 1932. No one knows how many beloved pets die each month from adverse reactions to lifesaving veterinary drugs. Protect your pet, yourself, and family members. Invest 110 seconds of your valuable time reading Prescribing Death, a concise report on medication & vaccine marketing, human fatalities, cancer and medication costs. Jean Townsend filed a class-action lawsuit on behalf of herself and other dog owners whose dogs had suffered or died after taking Rimadyl® (the ‘miracle drug’ for arthritis heavily advertised by Pfizer). The lawsuit alleged that Pfizer Inc. knew about the adverse side effects and did little to communicate them to pet owners. See Pfizer Settles Rimadyl Lawsuit and Pfizer Shape Shifting, shedding its animal health division after settling lawsuits.